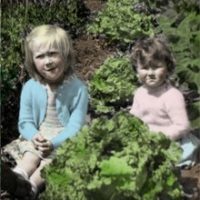 Late in September, I started bringing the kids back home after their summer holiday. That’s the houseplant kids, kids. This is always a good time to do it, to avoid them being stressed from the sudden change in conditions, especially from an early-fall chill like we’ve had in October 2018. And the first thing I had to do was find them a place to live! 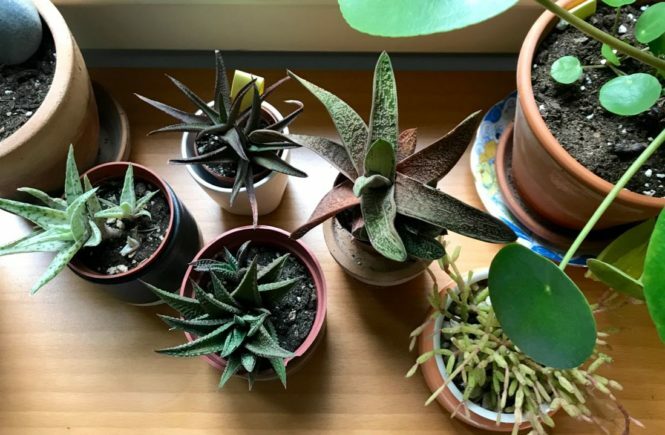 This year, installation of energy-efficient windows meant the sills and sashes from our 99-year-old ones were no longer available as fall and winter roosts on my only south-facing window for the succulents above. A new shelf on my office desk solved the issue. Others are tucked away here and there to make the most of available light. It was a good time to cull the collection. As Helen the Houseplant Killer, I already suffer from the condition called Too Many Houseplants. Here’s who’s still around. So far. 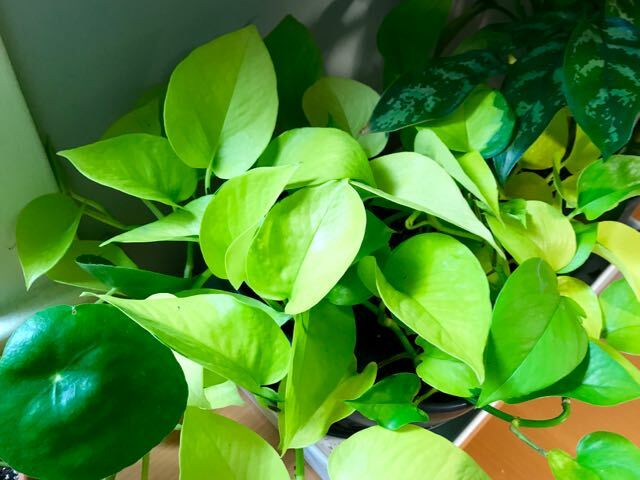 Old friends and new: Golden pothos (Epipremnum aureum), round-leaved Pilea peperomoides, and Chinese evergreen (Aglaonema). Checking them carefully for hitchhikers is the big second thing on the to-do list. I’m hoping to avoid pesky pests like scale, which can bloom indoors. One plant might have early signs of scale, which are sucking insects that tend to like hiding on the leaf veins. So I’ve isolated that plant, and scraped off any suspected scale insects with my fingernail. Fingers crossed. 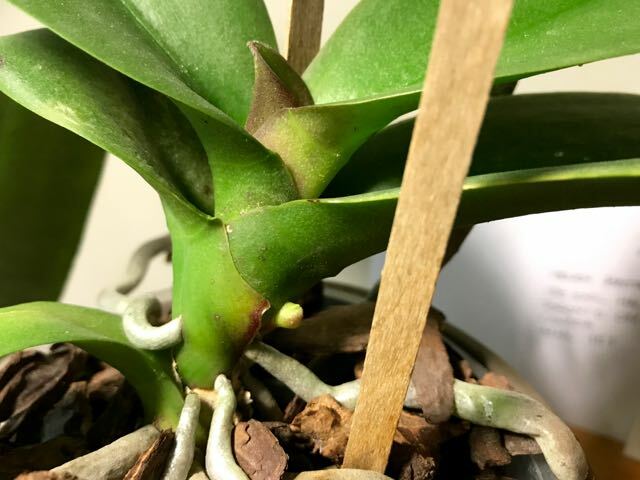 Hoping this is an emerging flower stem on my moth orchid (Phalaenopsis). The split tip seems promising. If it’s a root, that’s okay, too. New for me this year is a fan-shaped Sansevieria cylindrica. 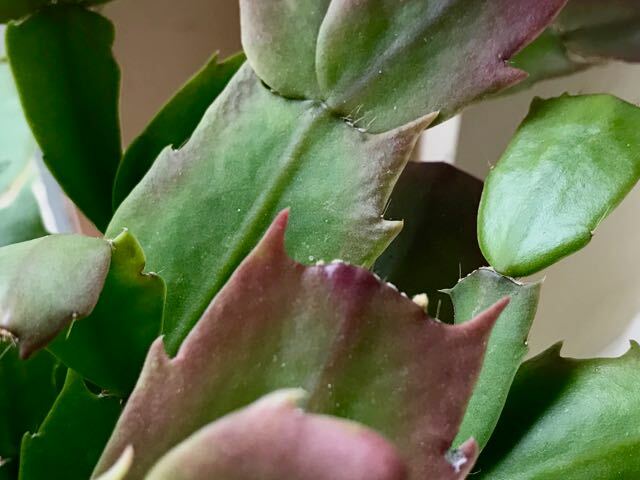 It’s showing the tail end of a blooming stem, a little squirrel tasting damage, and some new shoots. 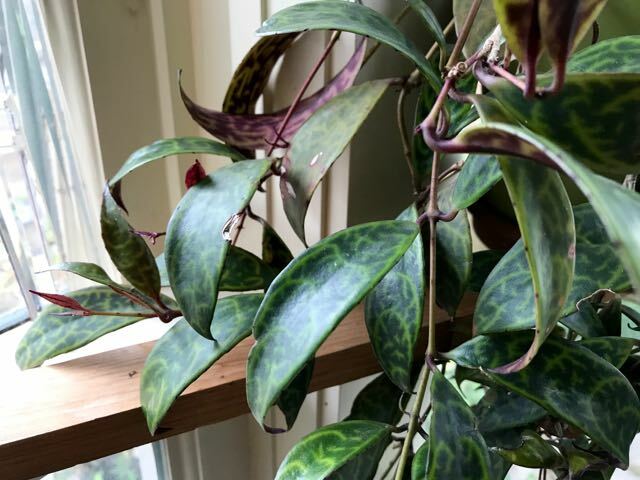 Old pals in the houseplant category are still on my unkillable list. 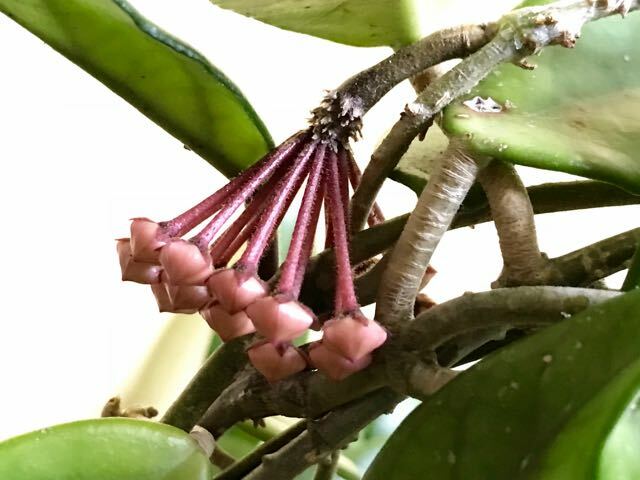 They include (below) the Hoya – putting out more blooms than ever – a lipstick plant whose name I forget [Update: It’s Aeschynanthus marmoratus], and Christmas cacti (Schlumbergera truncata) already showing infant buds. 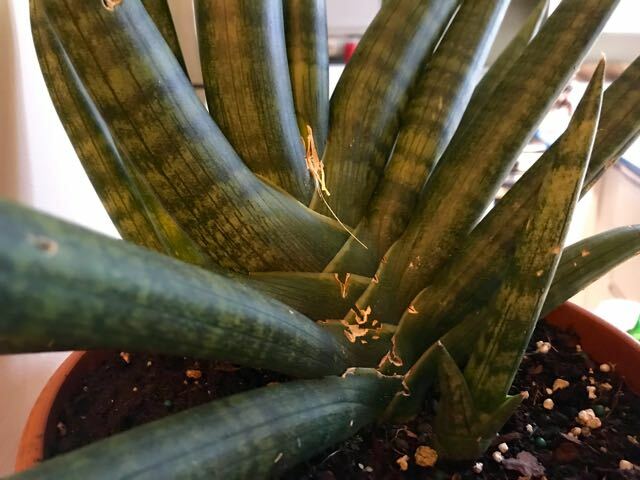 Hoping my new Sansevieria is just as hardy as its long-lived cousins. Inspired by Texas gardener Jenny Stocker, I’m trying earthstars (Cryptanthus) in driftwood. And my sister Sarah has gifted me two newbies for the houseplant family. 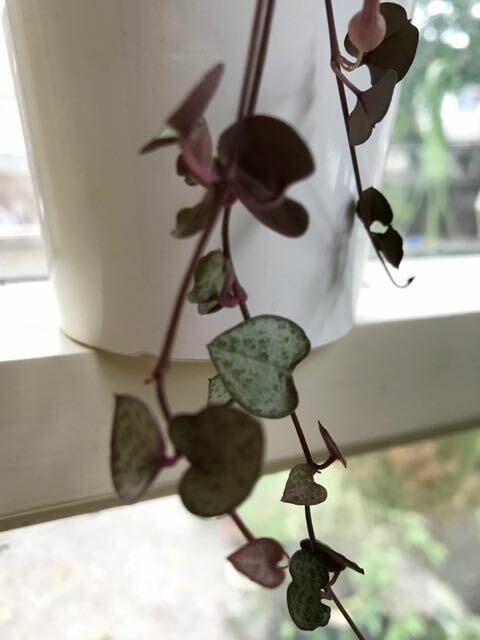 String of hearts or rosary vine (Ceropegia linearis woodii) which, she assures me, falls into the “unkillable” category. 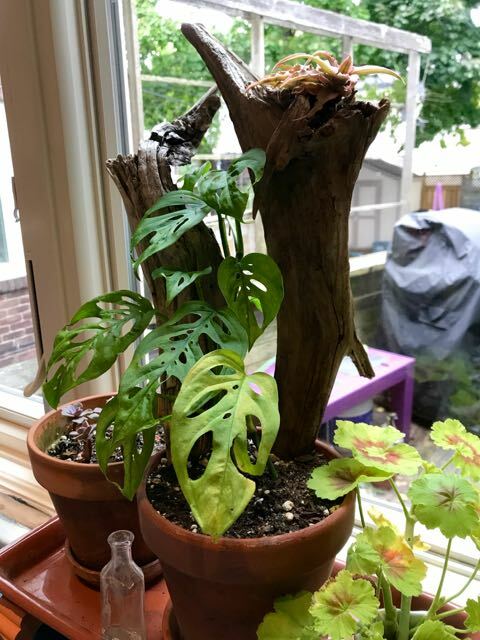 And a finely cut Swiss-cheese plant (Monstera adansonii), about which I refer you to the always entertaining and informative Mr. Subjunctive. Sadly, this last one is my scale-insect candidate. Send your good vibes to the houseplant gods for me. 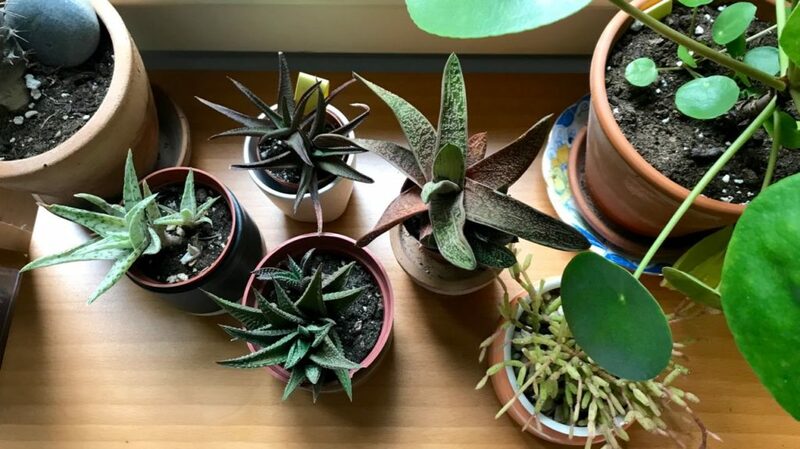 How’s your houseplant family doing? Good luck with those, Margaret! Still outside near Burk’s Falls on Oct 11! I don’t know what the weather’s been like out your way, Kate, but we’ve had some serious ups and downs in Toronto in fall 2018. 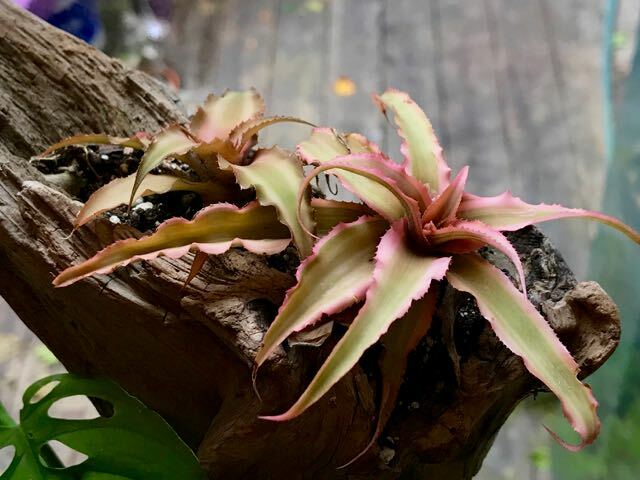 On the advice of Larry Hodgson a few years ago, I’ve been bringing my houseplants in (in truth, a few are still outside) around the end of September to reduce “indoor conditions” shock. Plus, it takes me a while to sneak them into various corners of the house. My houseplants have to be unkillable as well. A pothos and prayer plant have survived about 15 years now, just occasionally having a near death experience! A prayer plant! Oh my goodness, you are in a much luckier category than me, Jessica. I’d kill a prayer plant in no time flat.